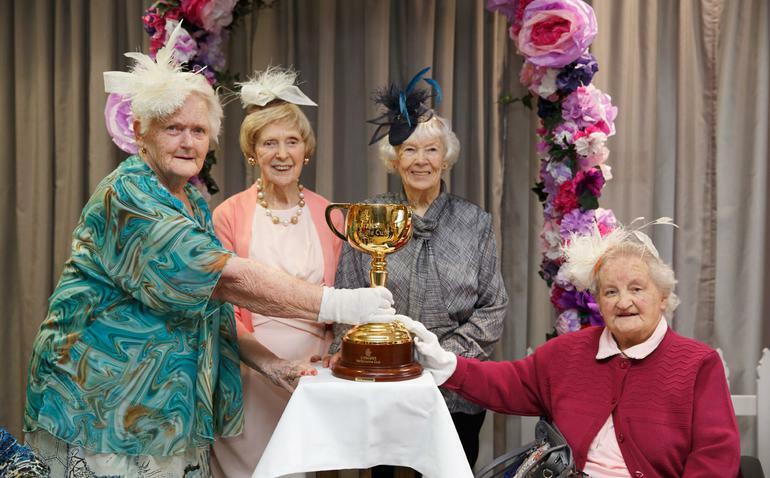 Just like at Melbourne Cup, there were feathers and flowers, horses and heroes, delectable delicacies and engaging entertainers, when Uniting AgeWell welcomed the Emirates Melbourne Cup Tour to one of its facilities recently. Uniting AgeWell Kingsville Community was selected as one of 34 destinations for the Cup’s Australasian Tour, as it makes its way to Flemington for the ‘race that stops the nation’ on Tuesday 1 November. 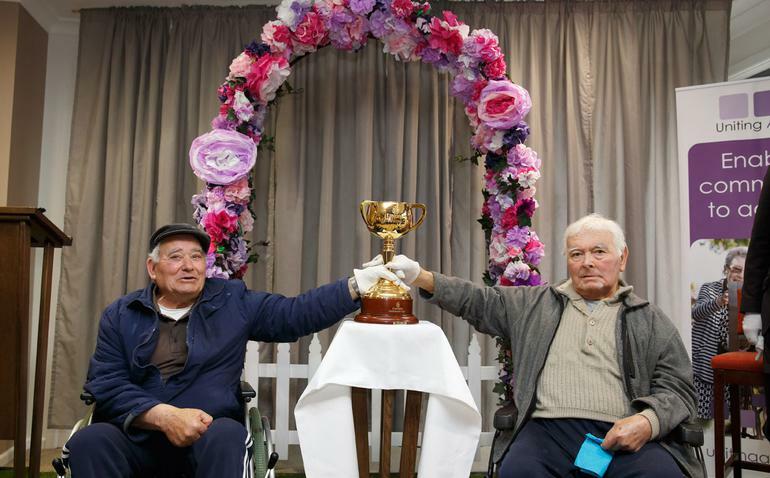 After weeks of preparation and anticipation, residents enjoyed a morning of reminiscence and celebration while admiring the Emirates Melbourne Cup trophy. The aged care residents created hundreds of paper flowers to decorate a rose arbour, with assistance from volunteers from Victoria University as part of their V4U volunteer day. Miniature wooden racing horses, created by community clients, decorated the lounge, and the ladies of Kingsville finalised their outfits by making hats and fascinators in a special workshop with milliner, Diane Kilduff of Hatiness. Uniting AgeWell Chief executive officer (CEO), Andrew Kinnersly, said the arrival of the $175,000 trophy illustrated the organisation’s commitment to community connection and encouraging older people to live and age well. “Many of our clients have lived most of their lives in the Kingsville and Footscray areas and have memories about local sporting events including the Melbourne Cup and Spring Racing Carnival in nearby Flemington,” he says. Three-time Melbourne Cup winning jockey and Australian Racing Hall of Fame inductee, Jim Johnson, was the guest of honour. He told stories about his historic wins, and how hailing from a racing family he was destined to be a jockey. “It’s a great feeling that you don’t realise at the time but stands by you later in life,” he said of his wins. 2002 Fashions on the Field Winner, Arabella Forge, shared her experience of winning Fashions on the Field as a young university student who loved the races and fashion. “The beauty of the competition is anyone can win,” she says. For Amarco resident John Stainsby the event brought back fond memories of seeing horse training near his family home in Maribyrnong. “Being so close to the tracks, I used to see them train all the time,” he says.